Probably my favorite moment with Julie was kind of a typical one: he was showing off like a kid. Sometime not long after Jean died—I guess it had to be maybe 20 or 25 years ago or so—I invited him over to my parents' house for their Passover Seder, the annual ritual dinner where you tell long stories about freedom and adventuring before you eat. My father is a little bit younger than Julie, but not much. The way he runs a Seder is to assign things to people to read on the fly, while he pages forward through the book looking for things to leave out that he supposes no one would miss. That way we can eat sooner. Jewish holidays, in my limited religious education, are usually about eating—sooner if possible. Apparently Julie had not been to a Seder in a number of years. Jean was always the spiritual one in the family; she went to church regularly and I guess he had always depended on her to cover him in the area of grace. There's a crucial point at the beginning of the Seder ceremony when the youngest person at the table reads a short but rather difficult paragraph in Hebrew called "The Four Questions." It's the kickoff for the storytelling part. My nephew Mitchell was not yet one year old, and my wife Pam, the next youngest, is generic Protestant and doesn't do Hebrew. So it fell to my youngest sister Robin to read the questions, and she never particularly enjoyed the role. First, she complained in her ritual manner about how long it had been since Hebrew school, and it turned out she didn't get to go through all the other caveats that generally preceded Robin's reluctant performance. "I haven't been to Hebrew school since 1928," Julie barked. "And watch this." And he read the Four Questions in perfect Hebrew, beginning to end, without tripping over a syllable. So it was that the oldest person at the table asked the Four Questions this time. My father was thrilled. It brought us an entire whining-session closer to the food. Julie was very proud of himself over this, of course. He generally was. A few days later, back at work, he showed me a gold watch he'd gotten for being the smartest kid in the Hebrew school he attended. It had Hebrew letters for the numbers, and I suggested it ought to run counter-clockwise, but it didn't. "The Governor's wife came and gave this to me," he said. And he waited for me to realize something, which I didn't. He got impatient quickly. "So who was the Governor's wife in 1928?" he asked me. Then I realized who the Governor of New York was in the late 1920's—and that the watch was presented to him by Eleanor Roosevelt. Julie was impish and wide-eyed and always suffered a little from a touch of arrested development—even into his eighties, but the thing most people who knew him never really thought about much was how incredibly bright he always was. He had a mind that kept working and didn't stop, I suspect, until early this morning. Eleanor Roosevelt noticed, though—and my little sister did. When we remember how it was that he could make so many of us happy, we might remember that a guy who knew as much as he knew, and understood as much as he understood, doesn't do much by accident. 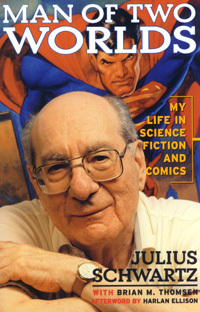 "This is a memoir of my eighty-five years in science fiction and comics."